Fancy lady lunch time! I love this dish for a luncheon because a) look how fancy b) it’s suuuuper simple c) you can make it ahead of time. This is exactly the kind of recipe I love to make: sophisticated but simple to make. 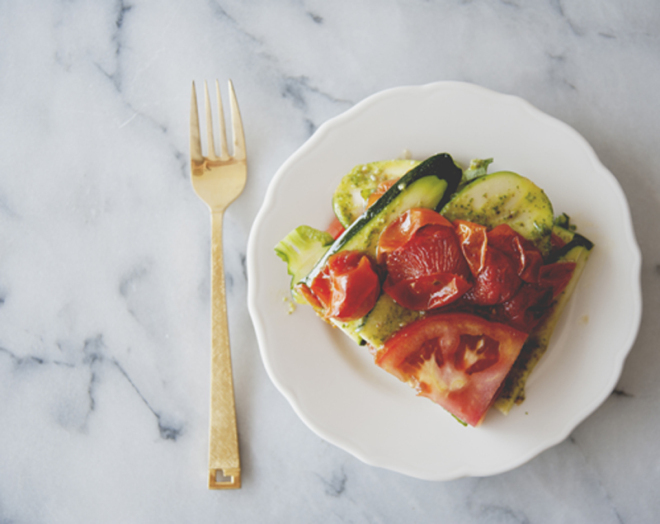 Thinly sliced zucchini replaces the pasta, and roasted tomatoes add a lovely depth of flavor. 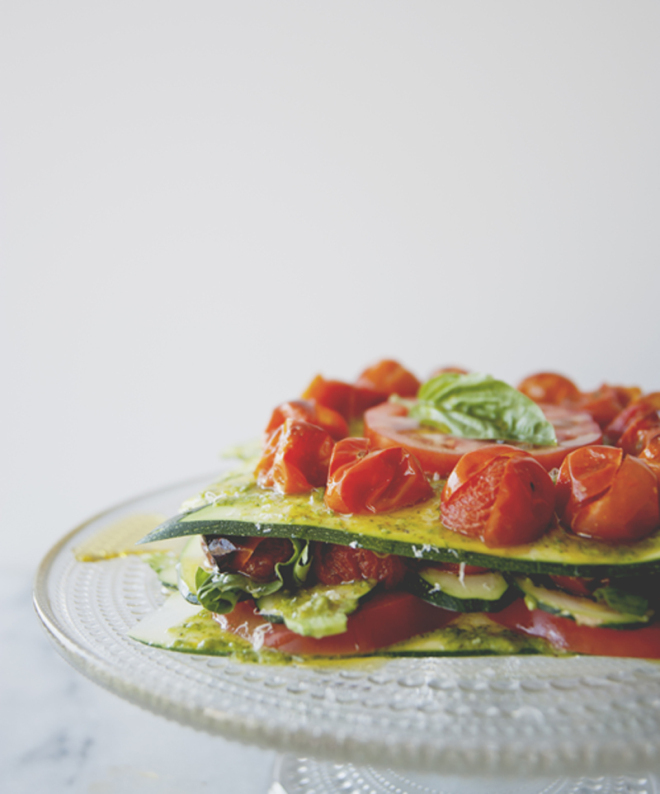 To make this dish raw, don’t roast the cherry tomatoes, just slice them up instead. Enjoy! Preheat oven to 425 F. Toss the cherry tomatoes onto baking sheet lined with parchment paper or a silicone pad. Drizzle with olive oil, and sprinkle with salt and pepper. Roast for 20 minutes until the tomatoes are juicy and slightly caramelized. Set aside. In a food processor combine the walnuts, garlic, and basil until smooth. Add big pinches of salt and pepper and while the food processor goes, drizzle in the olive oil. Taste for seasoning, and add more salt and pepper if necessary. To assemble, on a large plate line three pieces of zucchini slightly overlapping. Add about 2 to 3 tablespoons of the pesto (enough to coat the zucchini) and cover with tomato halves. Add another layer of zucchini. Sprinkle the cherry tomatoes and top with 2 tablespoons of the basil. 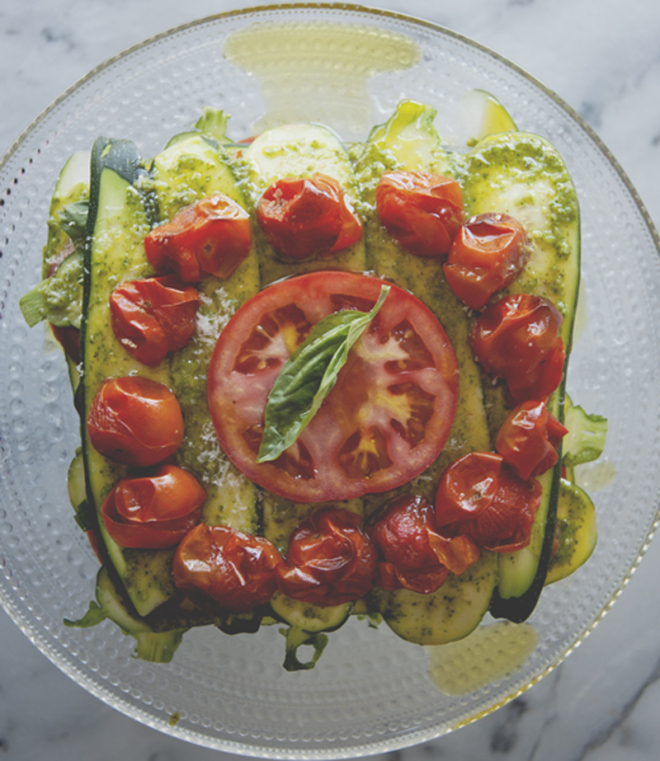 Top with another layer of zucchini, add the tomato slices and remaining cherry tomatoes, sprinkle with salt, pepper, and the remaining basil. Finish with a drizzle of olive oil. This entry was posted in lunch and tagged fresh, lasagna, raw vegan, sophistacated, vegan, zucchini on September 18, 2015 by sweetlaurel.